Did you suffer any damage with tropical storm Cindy? This was the first major storm of the summer but it probably won’t be the last. Although there are many safety precautions you can take to help you in a storm, what you might not be prepared for is what the storm leaves behind. There’s just no telling what kind of debris will get dumped in your yard. There’s also always the risk of potential flooding in your home. Those are two big messes that need to be cleaned up quickly and that’s easily taken care of with one call to Junk King Jacksonville. Junk King Jacksonville prides itself on providing the rapid response with every customer. 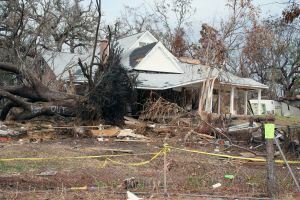 They know how important it is to take care of your storm debris removal in a timely fashion. Most sessions are completed within 24 hours the first contact with Junk King Jacksonville. You’ll find that the helpful customer service begins with that scheduling appointment. You might even benefit from having a same day appointment if you call early enough in the morning. The team from Junk King will arrive in a truck big enough to hold whatever it is you’re getting rid of. That includes any fallen tree limbs or carpeting that has been soaked with water. It’s vital to remove any what wet object from your home to make sure mold doesn’t start spreading. The best part about hiring Junk King is that they’re going to do all the work. The two-man moving crew assigned to your task will be lifting and loading any heavy object even ones that of been soaked with water. Of course, you don’t have to use Junk King Jacksonville just after a storm. You can also put them to work anytime throughout the year cleaning up rubbish from your yard or from the inside of your home. Everything that’s collected by Junk King has the opportunity to be recycled or donated. You don’t have to worry about making that determination. The crews have all been trained to sort through what they collect pull out those items that can be dropped off at a charity or recycling facility. The best approach to storm debris removal and junk hauling remains Junk King Jacksonville. This entry was posted in Jacksonville storm debris removal and tagged junk King Jacksonville, rubbish, storm debris removal on June 30, 2017 by Junk King. Last updated July 1, 2017 .